We believe that owning a beautiful handmade area rug should be an experience that brings joy, beauty and comfort to your surroundings. Surena Rugs has a highly experienced staff that has been primarily focused on providing all types of custom services for the past twenty-seven years. Handmade rugs are generally woven of wool, cotton, silk and sometimes synthetic fibers, dyed in either natural or chemical dyes. 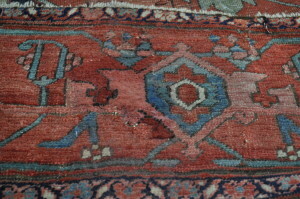 To restore the freshness and cleanliness of your rug, we use water and shampoo as well as certain other natural and chemical solutions for treatment of stains. Although it might sound simple, we strongly recommend that this process should be left to professionals with experience in this field in order to avoid unwanted results. Visit our showroom or website to view and choose from our extensive collection of antique, semi-antique, new and contemporary type rugs. 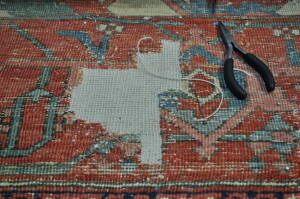 The art of restoring a handmade rug is one to be reckoned with. 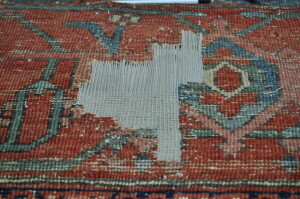 In fact, rug restoration is actually more difficult than making a rug from scratch. The best repair job is one that is essentially invisible . We are particularly pleased to employ the best repair artisans in the business, fully capable of restoring all types of handmade rugs. Our hands-on experience dealing with and studying the handmade rugs of all type, origin and construction on daily bases has given us an understanding of the nature and value of any rug at any time. 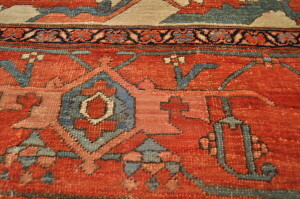 With this knowledge, we professionally evaluate and provide you with an educated detailed assessment of your rug. Almost all handmade rugs are laid on smooth surfaces like hardwood floors, tile or marble as well as on existing wall to wall carpeting. 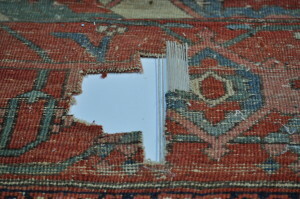 Padding underneath a rug is primarily used to keep the rug in place and to avoid slipping and buckling. The most common types of padding used today are shown below. 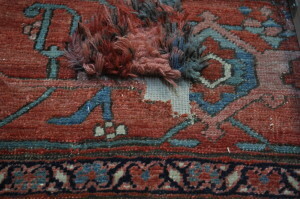 These paddings are stock items and always provided at no cost with the purchase of any rug. We at Surena rugs understand that purchasing a handmade rug can at times, be a bit more difficult than just going to a shop and selecting the one you like. To avoid making the wrong choice for any reason, we deliver the rug to your location, remove your furniture and place the rug in the designated area for you to view and make your informed selection (free within a reasonable distance).